John Mayer This is the second time that I have photographed John. I was fortunate enough to photograph his first album cover and it was amazing to see the transformation from nerdy guitar playing kid to Grammy Award winning artist. Samuel l. Jackson Ever since I was little, purple has been one of my favorite colors and it photographs great. I had read that it was also one of Sam?s favorite colors. 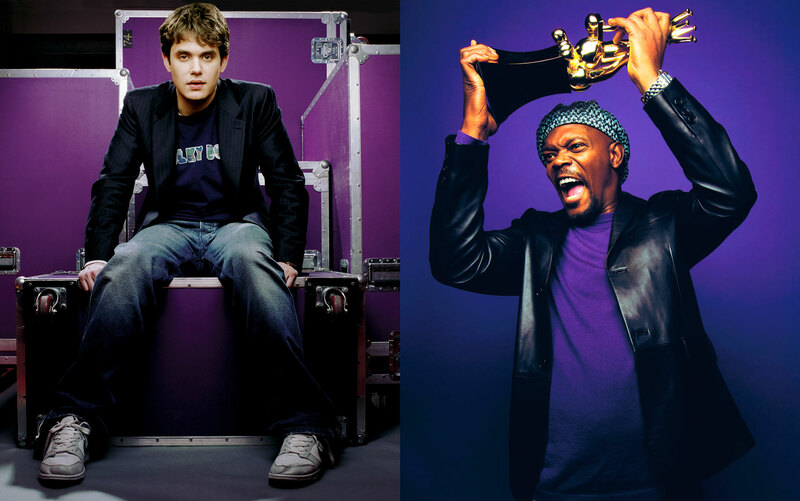 Sam likes purple so much that he convinced George Lucus to have Mace Windu carry a purple light saber. This photograph was a publicity shot for the Spike T.V. V.G.A. awards. They asked for a standard white background and for me to pick a colored background for an alternate shot. Purple was the natural choice. It was a total coincidence that he chose to wear a purple shirt.